Amanda Rasmussen welcomes you to the AR_Lab webpage! In these pages you will find out about who we are, what we are doing and where you can find us. Adventitious roots are roots that form from any non-root tissue. Adventitious roots form in many different plants under normal conditions and in response to different stresses and so are important in an Ecological context. They are also central to propagation of many commercially important plants in forestry and horticulture and so are Economically important. Many of our cereal crops depend on root systems made up of crown and brace roots - all types of adventitious roots. So adventitious roots are also important for our own Existence. 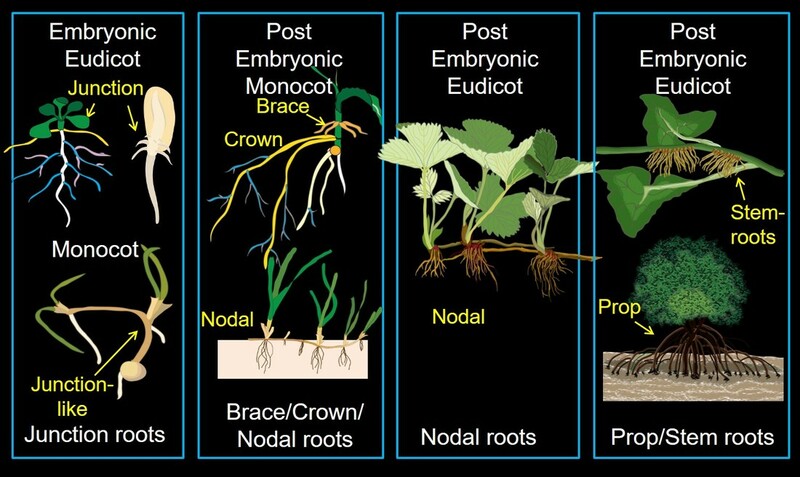 The AR_Lab studies how adventitious root types develop and respond to different environmental conditions in each of these 3-Es and aims to harness advantages for more efficient and resilient crop production and improved cutting propagation. Because stem roots are one part of a complete connected organism we also measure whole plant physiology such as photosynthetic efficiency, respiration rates, pigment levels and whole plant growth patterns. There are many different types of adventitious roots including roots that form as part of normal development. These can be grouped according to whether they form within the embryo or post-embryonically; whether the species is a monocot or eudicot; and by the part of the plant from which the adventitious roots form (for example from the hypocotyl-root junction, stem nodes or internodes). Examples of these are shown in the figure below. 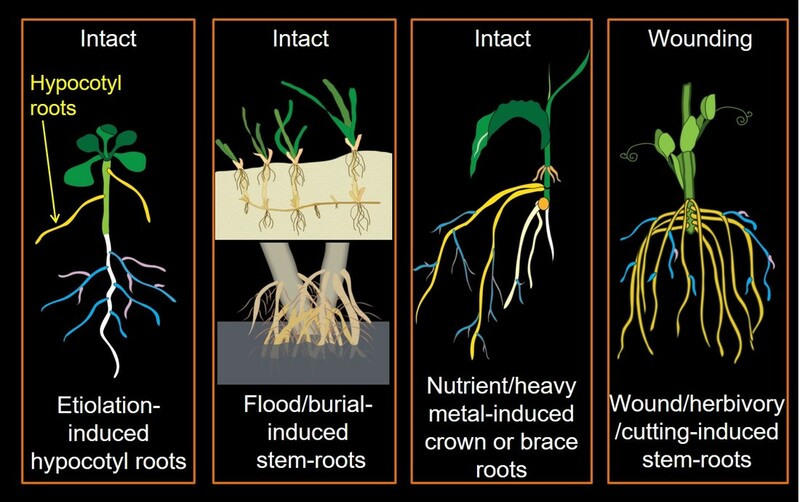 Adventitious roots also form in response to stressful conditions (see figure) including low light/etiolation, burial or flooding, nutrient deficiency, heavy metals or wounding (such as in cuttings). The figures on this page have been adapted from Steffens B, Rasmussen A (2015) The physiology of advantageous adventitious roots. Plant Physiology http:/​/​dx.​doi.​org/​10.​1104/​pp.​15.​01360. Since these roots are a normal part of development and often confer tolerance to different stresses, understanding how they function and respond in different conditions could help us develop new resilient crop varieties. In addition, many industries rely on cutting propagation including fruit trees and vineyards, ornamental plant production and forestry plantation propagation and our research will lead to improvements in propagation for these important industries.